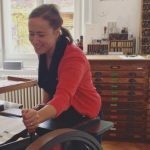 Ninniku Letterpress Boutique is back again, after so many years! I am very proud to present you my New Style Chandler&Price, Platen Press, 10×15! I already have find a letterpress furniture cabinet. Hi Ladies,I am still looking for that missing part, who can help me to find that additional part?Thanks very much! Hi Judith, that sounds very interesting, where did you get these boxes? @camillerobin That’s just wonderful of you! Big Thank! !